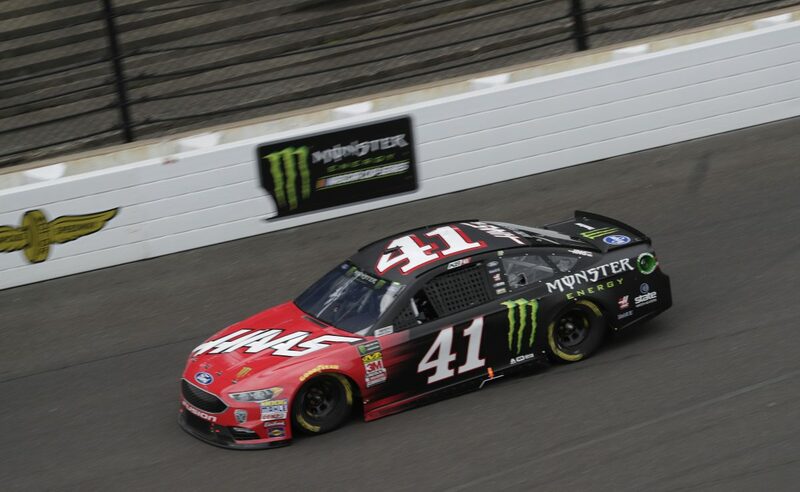 ● Kurt Busch started fourth, finished second and collected nine bonus points. ● Grabbed third place right at the start and held the position until the first competition caution on lap 12. ● “Little loose in, tight off,” Busch said on lap seven around the 2.5-mile oval. ● Busch took advantage of this caution and brought his Haas Automation/Monster Energy Ford to the pits for four tires, fuel and a left-rear wedge adjustment. ● Restarted in seventh place on lap 15 and climbed to fourth before pitting prior to second competition caution on lap 30. ● Busch pitted for four tires, but no fuel, on lap 30. He leapfrogged all those who were waiting until the caution came out to pit and took the lead. ● Busch led laps 33-44 and opened up a 1.5-second lead on his Stewart-Haas Racing (SHR) teammate Clint Bowyer before caution came out for an incident in turn one. ● Bowyer made his way past Busch on the lap-46 restart, but Busch held steady in second through the end of the stage. ● Pitted for four tires and fuel at the end of the stage, but it was a slow stop, and Busch left pit road in 25th. ● Started 25th, finished fifth and collected six bonus points. ● Had driven to 21st before a caution came out on lap 59 for an accident in turn three. ● Pitted for four tires and fuel on lap 60 and came off pit road in 27th for the lap-66 restart. ● Caution came out for an accident off turn two on lap 67, and Busch had to take evasive action to miss the wreck. This brought him up to 17th. ● As others pitted Busch gained even more spots, climbing to 12th for the lap-71 restart. ● Mired in traffic, Busch could make little headway, but he rose to fifth by the end of the stage as others ahead of him pitted. ● Pitted for four tires and fuel with a left-rear wedge adjustment at the end of the stage. ● Started 13th, finished sixth. ● “We’re just loose in when someone gets close behind me,” Busch said on lap 110 while running 14th. ● Busch cracked the top-10 on lap 124 with a pass of Erik Jones, and as others ahead of him began to pit, Busch continued to rise. ● By lap 127 Busch was in third place, and by lap 128 he was up to second. On lap 129, he retook the lead. ● Busch relinquished the lead on lap 136 and pitted for four tires and fuel. ● The No. 41 Ford restarted ninth on lap 157. Busch got a great restart and was sixth by the backstretch. That is where he finished. ● Busch qualified for the playoffs by virtue of his win in August at Bristol (Tenn.) Motor Speedway. ● Busch takes seven bonus points into the playoffs thanks to his Bristol victory and two stage wins. ● Joining Busch in the playoffs are his SHR teammates Kevin Harvick, Bowyer and Aric Almirola. SHR is the only four-car team to place all of its drivers in the playoffs. ● This was Busch’s 17th top-10 finish of 2018. ● Busch earned his sixth top-10 in 18 career Monster Energy NASCAR Cup Series starts at Indianapolis. ● Busch led twice for 19 laps to increase his laps-led total at Indianapolis to 22. ● Brad Keselowski won the Brickyard 400 to score his 26th career Cup Series victory, his second of the season and his first at Indianapolis. His margin of victory over second-place Erik Jones was .904 of a second. ● Keselowski’s triumph delivered the 102nd points-paying victory for Ford’s Fusion in the Monster Energy NASCAR Cup Series. It was Ford’s 671st all-time win in the NASCAR Cup Series. ● There were 10 caution periods for a total of 39 laps. ● Only 22 of the 40 drivers in the Brickyard 400 finished on the lead lap.